孟哲, 腾帅, 王琛, 白雪洋, 李海禹. 积雪草酸通过激活Nrf2抗氧化通路抑制自发性高血压大鼠心肌纤维化[J]. 中国药理学通报, 2018, 34(8): 1073-1077. MENG Zhe, TENG Shuai, WANG Chen, BAI Xue-yang, LI Hai-yu. Asiatic acid inhibits cardiac fibrosis via activating Nrf2-mediated anti-oxidant signaling pathway in spontaneous hypertensive rats[J]. Chinese Pharmacological Bulletin, 2018, 34(8): 1073-1077. Abstract: Aim To explore whether asiatic acid(AA) inhibits cardiac fibrosis, the common but irreversible pathological phenomenon caused by different cardiovascular diseases in spontaneous hypertension rats (SHRs) and its probable molecular mechanism. Methods Rats were divided into four groups:control group (Wistar Kyoto rats, Wkys, n=10), SHRs group (SHRs, n=10), SHRs+AA group (SHRs+AA 20 mg-1·kg-1·d-1, n=10), and AA group (Wkys+AA 20 mg-1·kg-1·d-1, n=10). The level of collagen deposition was measured by Sirius red staining. The concentration of malondialdehyde (MDA), superoxide dismutase (SOD), and total antioxidant capacity (T-AOC) were measured by colorimetry. 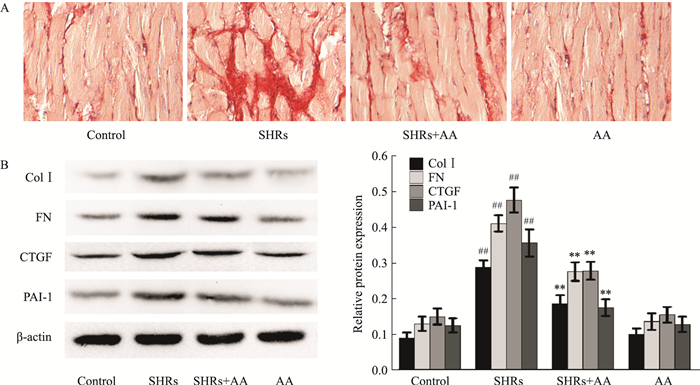 The protein expressions of plasminogen activator inhibitor-1 (PAI-1), connective tissue growth factor (CTGF), collagen I (Col Ⅰ), fibronectin (FN), nuclear factor E2 related factor 2 (Nrf2), quinone oxidoreductase (NQO1), hemeoxygenase-1 (HO-1), p-Akt, p-GSK-3β and Fyn were measured by Western blot. Results AA could reduce the level of collagen deposition and the expression of CTGF, PAI-1, Col Ⅰ and FN. AA suppressed the production of MDA, but elevated the activity of SOD and T-AOC. 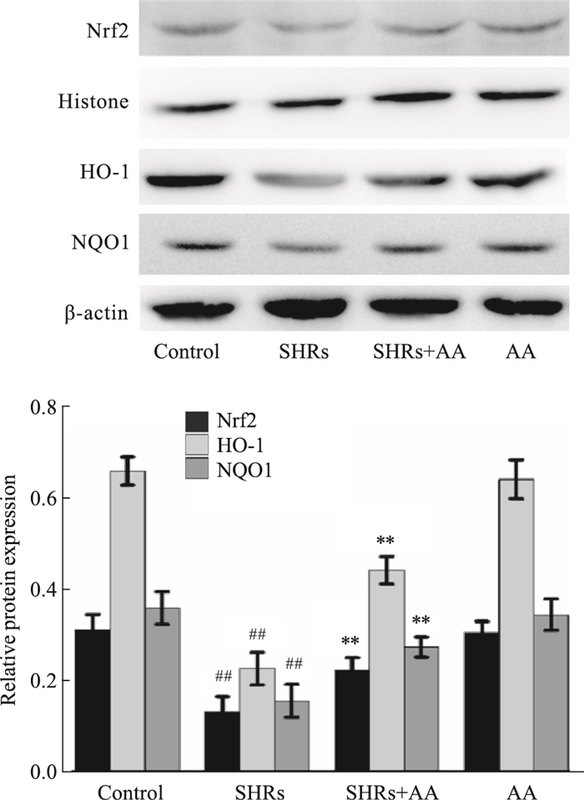 AA also up-regulated the nuclear translocation of Nrf2 and the expression of NQO1 and HO-1. 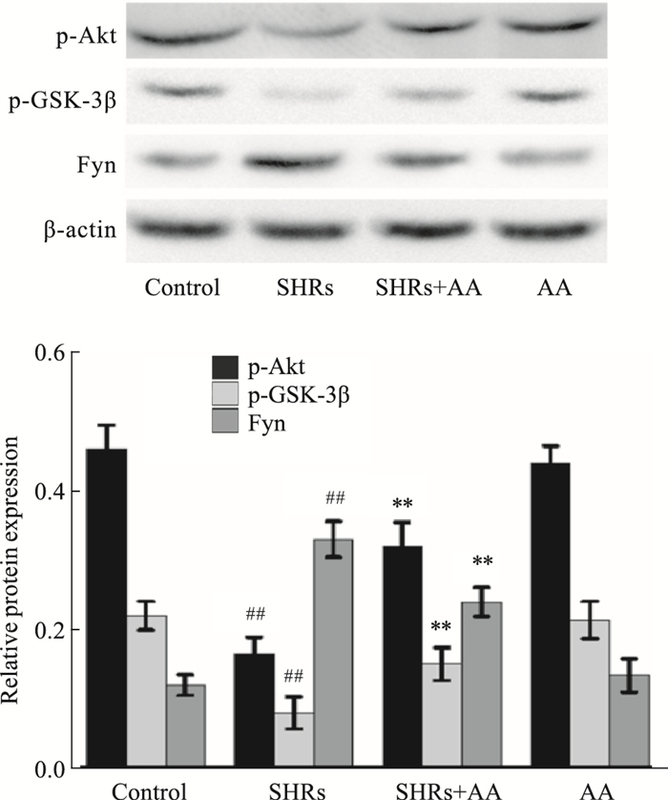 Furthermore, AA increased the phosphorylation of Akt and GSK-β, and inhibited nuclear translocation of Fyn. Conclusion AA could partially inhibit cardiac fibrosis in SHRs, which is probably dependent on up-regulating Nrf2-mediated oxidant signaling pathway. 朱凯媛, 蔡辉. 氧化应激致心室重构的研究进展[J]. 安徽医药, 2015, 19(9): 1633-6. Zhu K Y, Cai H. Research progress on ventricular remodeling induced by oxidative stress[J]. Anhui Med Pharm J, 2015, 19(9): 1633-6. 李航, 段惠军. Nrf2/ARE信号通路及其调控的抗氧化蛋白[J]. 中国药理学通报, 2011, 27(3): 300-3. Li H, Duan H J. Nrf2/ARE signaling pathway and the anti-oxidative proteins controlled by it[J]. Chin Pharmacol Bull, 2011, 27(3): 300-3. 孟哲, 李海禹, 刘宇宙, 等. 积雪草酸通过调节TLR4和PPAR-γ活性抑制内毒素诱导的血管平滑肌细胞炎症反应[J]. 中国药理学通报, 2018, 34(1): 60-7. Meng Z, Li H Y, Liu Y Z, et al. Asiatic acid inhibits LPS-induced inflammation through regulating TLR4 and PPAR-γ in VSMCs[J]. Chin Pharmacol Bull, 2018, 34(1): 60-7. Wu J, Xia S, Kalionis B, et al. The role of oxidative stress and inflammation in cardiovascular aging[J]. Biomed Res Int, 2014, 2014: 615312. Liao H H, Zhu J X, Feng H, et al. Myricetin possesses potential protective effects on diabetic cardiomyopathy through inhibiting IκBα/NF-κB and enhancing Nrf2/HO-1[J]. Oxid Med Cell Longev, 2017, 2017: 8370593. Chinese Pharmacological Bulletin, 2018, 34(8): 1073-1077.